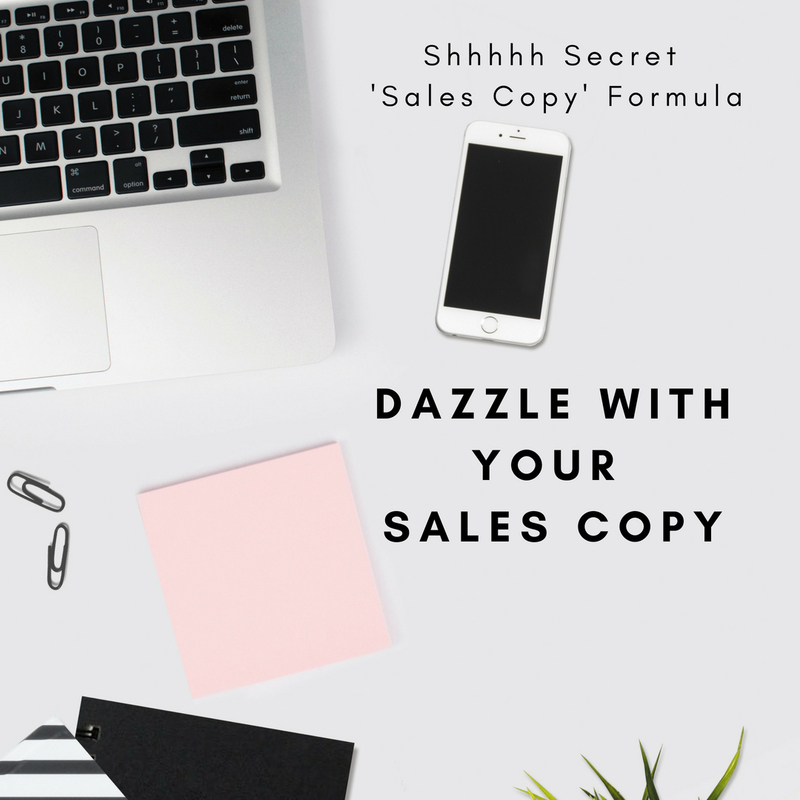 Do you ever struggle with sales copy? Well you’ll love this below if you do, read on. ..and the best part is it’s super easy for you to learn and apply! Let’s face it, killer copy makes your customer take action. This simple formula helps empowers your customers to buy from you faster, that’s no B.S! Stop the frustration of your website not converting sales or low enquiries. You worked so hard making it look beautiful. Apply this simple formula and start feeling confident in seeing instant results (as long as you have traffic visiting your page). NOTE: Most of the time your high level of product expertise is actually what’s killing your copy currently…why? The more you know about your product/service, the the more logical your explanation it will be. Why? Because it’s a high chance you’re killing the sale with wayyyy too much of the wrong detail. Experts don’t realise that they get caught up with heavy logical jargon that dis-empowers their customers to take action. Straight talk for a moment…belwo you’ll see the formula and the good news is you’ll be great at the P.
It’s the last two parts of the formula that follow is what needs the most focus. The O and the E, these both connect to the customer power of their emotion which is how people buy and also helps logically justify their purchase. Pack your description with more punch around the feelings and outcomes and you’ll start seeing the difference in your conversions. *I’ve written a very simple example below making it so transparent for you to see exactly how easy this formula is to use. PLUS a real life story about a famous online sports shop called Style Runner. P – Product: What it is, how it works, how many times they need to use it, a service you have or a feature of a product. O – Outcome: What is the outcome of the product, the solution it fixes, the results it give, the impact it has. E – Emotion: How will the customer feel from the outcome mentioned above, how will they stop feeling? How will they start to feel? How will it impact them emotionally? Here’s an example I think most people would understand as most of us have had a website built for it before. Website Designer: Here at website world (P) we can build you a WordPress website (O) that will have you stand out against your competition. (E) Feel confident whenever your potential customer lands on your website, knowing that they will feel empowered to buy. (P) Get unlimited pages created, such as the all important ‘About Us’ page, ‘Blog’ page and product pages, (O) that will be easy for your customers to navigate around (E) so you don’t have to feel frustrated in cutting out some of your best content as our websites can hold everything your business needs. Now to really step it up a notch try and reverse the formula and start with the emotion first. Quick story about Style Runner. In 2012 they learnt how to ‘green brain’ their website from listening to my husband and I talk about a similar formula. Over that weekend they placed emotional connection to every item of clothing description and BOOM…300% increase in sales the next 30 days. This is the power of being able to draw your customers into your content and let your copy do the selling. This entry was posted in Blog and tagged conversions, emotion, logical, online sales, outcome, product, sales, sales copy, secret copy, Style Runner on July 20, 2018 by Admin.